There’s always that strange gap in your life, when you’ve finished one project, and you wonder what to do next to fill the hole. I even feel it when I’ve read a really good book. What to read next that doesn’t take away from the one I’ve just finished, but is just as good to read. After a bereavement, it’s perhaps even more important to carefully consider what next? Where do I go from here? How do I find a new way of living that does nothing to deny the person who has gone, but enables me to continue. 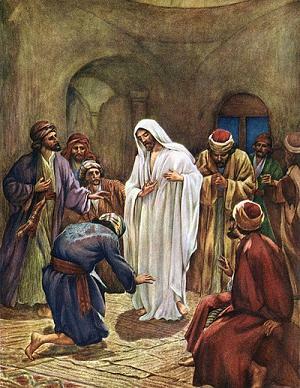 36 While Jesus’ disciples were talking about what had happened, Jesus appeared and greeted them. 37 They were frightened and terrified because they thought they were seeing a ghost. 40 After Jesus said this, he showed them his hands and his feet. 41 The disciples were so glad and amazed that they could not believe it. Jesus then asked them, “Do you have something to eat?” 42 They gave him a piece of baked fish. 43 He took it and ate it as they watched. The Scriptures say that the Messiah must suffer, then three days later he will rise from death. 47 They also say that all people of every nation must be told in my name to turn to God, in order to be forgiven. So beginning in Jerusalem, 48 you must tell everything that has happened. The disciples must have had such a hole in their lives. They had given up everything to follow Jesus, their previous life was gone. He was not just a new friend, but a whole new way of living – what to do now that he was gone? Jesus would have realised this, and so he doesn’t leave them, just floundering, he comes to them. He lets them touch him, reassure themselves, ask their questions, and he feeds them. And as they eat, he teaches them, showing them how everything that had happened had been led to by what was written in the scriptures. And then he gives them their new task, their what next, to use the trendy jargon he re-purposed them, or refocused their lives. They have got to go and tell everyone what has happened. They are not to hide away, frightened and unsure. As they lived with Jesus during his earthly life, they are to continue to live, sharing the message that he lived, bringing others to a place where they can find God and be forgiven. We too continue to be called to tell others. By words, by actions – by living God’s way we are to tell everything that has happened. That is what’s next – are you in? that the disciples were not left frightened and purposeless. and gave them their purpose.